Hello, I’m Dr. Naghmeh Pashmini. Welcome to our dental practice! I am an Associate General Dentist here at Nova Dental Partners working alongside Dr. Kamran Tavakkoli, Dr. Kambiz Tavakkoli and Dr. Bryan Choi. I received a Bachelor’s degree in biological sciences from George Mason University in Fairfax, Virginia and also earned a Doctorate of Dental Medicine from Case Western Reserve University, in Cleveland, Ohio. My mission is to take care of my patient’s dental needs, address their chief complaint and be gentle in all aspects of their care. I am very proud to have been placed on the Dean’s list for being amongst the top 10% of my class. I was also awarded an honors delegation for outstanding patient care. 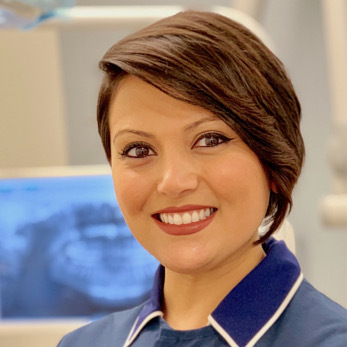 After graduating from Dental school, I completed General Practice Residency at the Veterans Affairs hospital in Pittsburgh, Pennsylvania where I expanded my knowledge in advanced surgical, restorative and endodontic procedures as well as treating medically compromised patients. I am proud to be an active member of Academy of General Dentistry, American Association of Cosmetic Dentistry and American Dental Association. I strive to continually enhance my knowledge and skills through continuing education courses. I have received additional training in placement and restoration of dental implants as well as Invisalign and cosmetic procedures to be able to provide my patients with world class service. I truly love the artistic aspect of dentistry. The precision of our work is what I like the best about my profession. I am dedicated to providing my very best work to each and every one of my patients. I am an animal lover and enjoy hiking and running with my dog, Leo. In my free time, enjoy travelling and trying new cuisines.